Amazing! I\'d love to see it one day from the sea and air! Incredible. I\'m 33 now – I hope to god that humanity doesn\'t find it in themselves to be able to even screw this corner of the world up to the same extent it has so many other places. Thanks for sharing your experiences with us. 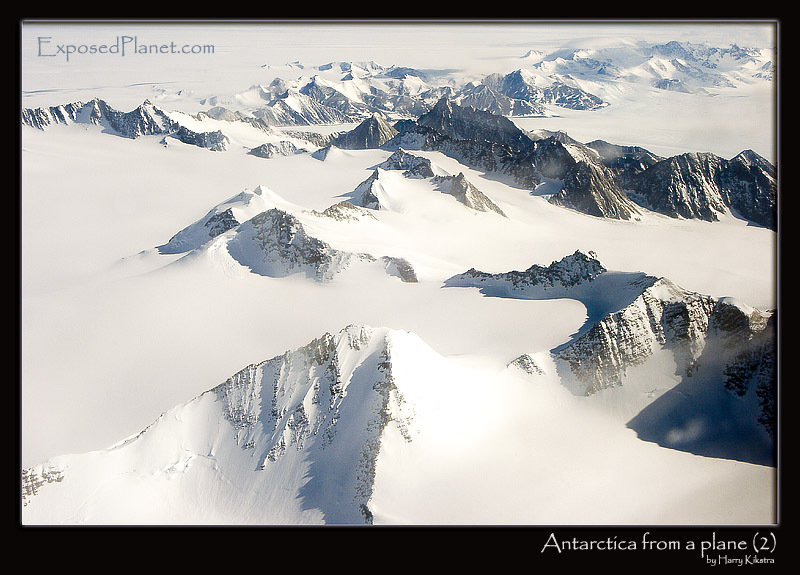 The story behind "View from a plane (2), Antarctica"
About 98% of Antarctica is covered by the Antarctic ice sheet. The ice sheet is, on average, 2.5 kilometers (1.6 miles) thick. The continent has approximately 90% of the world’s ice (approximately 70% of the world’s fresh water). If all of this ice were melted sea levels would rise about 61 m (200 feet). In most of the interior of the continent precipitation is very low, down to 20 mm/yr; in a few “blue ice” areas precipitation is lower than mass loss by sublimation and so the local mass balance is negative. In the dry valleys the same effect occurs over a rock base, leading to a desiccated landscape..